It was 100 years ago that the Regent Theatre first opened its chrome-handled doors to the Allegan community with a live vaudeville show followed by a screening of the silent musical comedy, Oh Boy!, complete with full musical accompaniment in the orchestra pit of the then brand new 500 seat auditorium. Robert Dunham, who opened the Regent Theatre in October of 1919, saw great success throughout the 20s with live vaudeville shows and silent pictures. As times changed and technology advanced, with the 30s came talkies after Al Jolsen’s The Jazz Singer in 1927. As the entertainment evolved, so did the aesthetic of the theater. During the 1940s, the Art Deco redesign, as we know the theater today, took place -- the addition of the uniquely paneled interior and exterior walls, the intricately tiled lobby, and most famously, the glittering neon marquee. The Regent Theatre as it was in 1939. As the Regent changed hands in management, it continued to enjoy many decades of success. That is, until the 1980s when it had to compete with multiplex cinema chains. After nearly a decade of closure, Allegan’s Regent Theatre faced demolition, but not before a committed group of residents took it upon themselves to reopen the movie theater as the nonprofit, The Old Regent Theatre Co. After much effort, the reestablished venue was refurbished and ready to entertain the masses once again in the early 90s. However, tragedy struck in June of 1997 when all of the effort of the community group was undone by a violent rainstorm that collapsed the roof of the building, causing absolute devastation. After an unbelievably valiant community effort, the Regent Theatre was restored to its former glory, and once again reopened to much fanfare two years later in 1999. It was then that the City of Allegan stepped up and took over operation of the historic, one screen movie theater, and remains in ownership of it to this day. 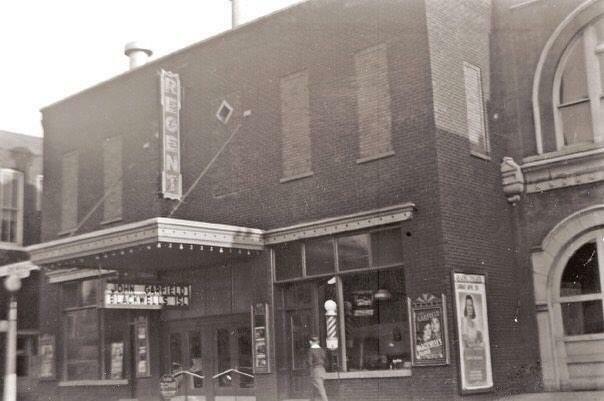 As time went on and vaudeville transitioned to black and white silents, from talkies to technicolor, and 35mm film to digital projection and surround sound, the Regent Theatre has always been a community gathering place for the City of Allegan. It is both an important place in history and in the hearts of so many who hold special memories in this 100 year old, one screen movie theater.